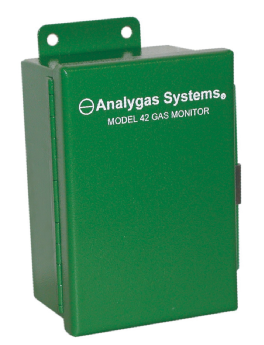 Analygas® Systems Model 42 is a gas monitor that supplies 4-20mA signals proportional to detected gas concentrations. It is used in conjunction with our Model 20, 20B, 40 or 41 multipoint readout units. Alternatively, it can be interfaced with a computer or other data acquisition system. The Model 42 protects people and produce from excessive exposure to toxic and other gases. Analygas® Systems Model 42 is a wall mounted gas monitor for use in non-hazardous indoor locations. It utilizes electrochemical technology to measure gas concentrations. The electrochemical sensor in this instrument is specific to the target gas and minimizes the chance of false alarms from interfering gases or vapours. The Model 42 can resolve gas concentrations down to a few parts per million (ppm). For Ammonia detection in refrigerated areas, it functions effectively down to -40ºC. Housed in a rugged steel enclosure, it can be mounted on any convenient vertical surface. The signal output is a linear function of gas concentration. The standard 4-20mA output format will interface with almost any data acquisition and control unit. The sensor is located in a recess at the bottom of the enclosure. This provides good physical protection while offering maximum exposure to the environment being monitored.